No doubt ‘implementation of the Cotton Standardization and Grading System (CSGS) at the grassroots level is vital for the promotion of contamination free and clean cotton production in the country’, but ‘transmission and adaptation of contamination free cotton production technology’ still stands as a big question for producers; because most of the cotton growers, ginners and other producers or probably all didn’t know that, hence it needs special attention, which is actually basic need of today as well as tomorrow, when we must compete in market with all rules and regulations of WTO. cotton growers and serve as a reminder for researchers so that they could plan their future strategies and for extension workers so that they may to be alert. 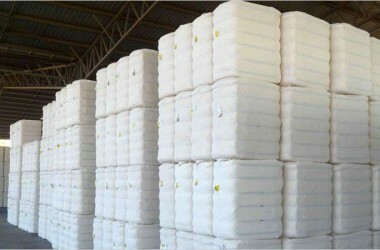 However, cotton is one of the most important fiber and cash crops of Pakistan, which earns foreign exchange for the country. The crop has maximum area in Punjab followed by Sindh and very negligible in NWFP. The yield per hectare of seed cotton in Punjab is more to that of Sindh province. Archaeologists and historians believe that cotton existed 5000 years ago. Mohan-jo-Daro was nature place of cotton, where the people knew the arts of spinning and weaving. Cotton lint was separated from seed on charkha (a kind of hand cranked roller gin) and the fibers processed in to fabrics with drop spindles and primitive looms. The quality of the textile produced has been excellent. The history of ‘cotton crisis’ is also as old as its cultivation, therefore, that may also not to be ignored. Following poem of Shah Abdul Latif, a saint poet of Sindh can be quoted as first example (during 1689-1752 AD). The second example regarding cotton diseases was quoted in Taxas Agricultural Experiment Station Bulletin No.4 (1888). Palmel studied and wrote about root rot of cotton. The struggle against cotton diseases continued up to date. It had been revealed that this crop was subjected to more than 60 diseases. The diseases reduced the yield and brought about heavy losses. The work carried out so far in Pakistan shows that seedling rot or wilt, root rot, boll rot, anthracnose, different types of leaf spot diseases, premature opening of bolls (Tirak), stunting and reduction in size of leaves, some nematode species, bacterial blight (angular leaf spot and boll rot), leaf curl and stenosis of cotton, found causing damage to the crop. Such diseases are injurious in some areas, in some years and on some plant parts. The magnitude of disease damage depends up on the environment and cultivar. The crop record revealed that root and boll rot diseases of cotton were considered as most severe and destructive, but since last decade, cotton leaf curl virus (CLCV) found to be most important disease. This disease was first time recorded in 1967 at Multan on cotton plants. In Sindh, this disease was first reported during 1996 at Ubauro, District Ghotki. CLCV crossed New Saedabad, District Hyderabad during 1999-2000. It was considered a minor disease until 1987, but in 1991-92, it infested 35,000 acres and 294,000 acres during 1992-93 causing a huge production and monetary loss to the nation. Cause: The disease causing virus belongs to Gemini group. Symptoms: Upward and downward curling of leaves accompanied by small as well as main vein thickenings (SVT as well as MVT) on leaves, pronounced on underside. If a diseased leaf is viewed from beneath against the light, thickened vein found darker green and opaque than the normal. In extreme but not in frequent cases, formation of the cup shaped or leaf laminar (veins) out growth called “enation” appears on the back or underside of the leaf. The newly produced leaves are small, excessively crinkled and curled at the edge. The primary stem often tends to grow taller than normal. The enter-nodes being elongated and irregularly curved but sometimes the whole plant is stunted. The flowers checked in growth and become abortive. Bolls remained small in size and failed to open. All parts of badly hit plants are very brittle and ready broken. Transmission: The disease transmitted by feeding of the white fly, Bemisia tabaci with in 6.5 hours. A single female, carrying virus, can infest many plants. It may also be kept in mind that white fly is known to survive on as many as 53 host plant species, and is responsible for transmitting 23 crop diseases in region. At global level, white fly infests 600 different plant species. Cause: Aspergillus niger, Fusarium oxysporium, Rhizopus oryzae (belongs to fungi) and a bacterium Xanthomonas malvacearum reported as predominant causes of boll rot. Black boll or Aspergillus rot: Affected bolls start losing green color altogether, become pinkish brown and finally sooty black due to over growth of fungus. Rhizopus rot: Infected portions become grayish along with softening of internal tissues. The fungus grows abundantly and covers many bolls under moist conditions. Fusarium rot: The bolls become dried with color assuming reddish and brownish tinge and showing dry and white fluffy fungal growth inside the bolls on opening. Bacterial or Xanthomonas rot: Water soaked areas developed on the bolls giving out gummy substance and foul smell. Perpetuation: Diseased plant debris and seeds carry over the disease causing organisms. Humid conditions after rain and speedy wind favor the spread and severity of boll rot. Sometimes, different boll worms also play a role, to transmit disease, from infected to healthy bolls or plants. Cause: A bacterium Xanthomonas malvacearum cause angular leaf spot or bacterial blight or boll rot of cotton. Symptoms: The disease attacks all parts of the plant above ground level, at all stages, causing seedling rot, angular spots on leaves and stems (sometimes called black arm disease) and boll rot (as already mentioned). In initial stages, water soaked lesions (spots) appears on lower surface of the leaves. Later on, these spots increase in size, turn brown to black, becoming necrotic, angular and are visible on the upper surface. These spots vary in size and then coalesce, forming irregular patches and giving rise to gummy bacterial exudates. Heavily infected leaves turn yellow and drop down. The disease produces elongated black lesions on the stem, branches and petioles. Stems show cracking and gummosis (gummy substance) and are easily broken, even by wind. Bolls are marked by the appearance of water soaked lesions, which are dark brown to black, invariably sunken, results in reduced boll size, poor production of lint and loss in viability in seed. Perpetuation: Infected seeds and plant debris act as a source of infection, but can also spread through irrigation water, rain splashes, wind, insects and contaminated field implements. Cause: The fungi Macrophomina phaseolina, Rhizoctonia spp., Fusarium spp. etc. are predominantly isolated from diseased roots. Symptoms: The disease affects the roots exclusively, causing pre-wilt shedding of leaves, yellowing of foliage, disintegration of root tips, discoloration and shredding of roots, exudation of drops of smelly liquid from the rotted plant parts. Mostly, wilting of shoots occur in only few diseased plants, which ultimately results in the death of entire plant. This disease generally appears, when plants are about 4-6 weeks old and continue up to boll formation. Diseased plants can be easily pulled out of the soil, appears in patches. Roots and root-lets show rotting, yellowing, disintegration and shredding. Perpetuation: Disease causing fungi are soil borne, hence it may be claimed that both (fungi and soil) factors are responsible. Anthracnose, leaf spots (caused by different fungi), sooty mold, stenosis, stunting and premature opening of bolls (Tirak) etc. are also reported to cause disease in cotton and damage to the crop, which may reduce the yield, sometimes very low and sometimes so much. Following disease management practices may help to save the crop from all above major and minor diseases of cotton. • Cultivation of disease resistant variety is only safe measure of all different diseases. • Eradication including collection and burning of plant debris may help to control seedling, root and boll rots as well as bacterial blight, because disease inoculum may also survive through plant debris. • Deep plowing with short duration, at least two months before sowing, help to control seedling and root rot. • Proper land leveling is a preventive measure against seedling and root rot. • Use of healthy seed, acid delisting and chemical seed treatment minimize the disease incidence of seedling, root and boll rots as well as bacterial blight. • Crop rotation with non-host i.e. sowing of sorghum for 3 to 4 years is useful for control of seedling and root rot. • Mixed cropping with kidney bean or fodder and leguminous crops saves the cotton crop from root rot. • Proper use of irrigation and chemical fertilizers improves the disease resistant power in cotton plants. • Early sowing of crop is preventive measure for control of boll rot. • White fly transmits cotton leaf curl virus from diseased plant to healthy one, whereas, different cotton boll worms may play a role to transmit the boll rot diseases, hence white fly and boll worms must be controlled. • Lady’s finger (okra), sun kukra, china rose, thorn apple (dhatura), mint (podina), karund, cucurbits (especially water melon), beans, tomatoes, tobacco, chilies, soy bean, sun flower, cow peas, egg plant (brinjal), holly hock (gul-e-khera), zinnia, sesame, Ak (Calotropis), shesham, citrus species etc. are recorded as alternate host plants of cotton leaf curl virus as well as white fly, and also some of them are alternate host of boll worms. Therefore, they all must be eradicated before and during cotton cropping season. Cotton growing zones may play a better role for this purpose. Meanwhile, use of proper cotton production technology as per recommendations of agricultural experts or researchers is economical and most effective for cotton disease management. It is out look and responsibility of the cotton growers to adopt the modern cotton production technology and play a role for the development and prosperity of the country. By M. Mithal Jiskani, Assistant Professor (Plant Pathology), Sindh Agriculture University, Tandojam.